Bottle with sponge applicator for polishing and brightening shoe leather quickly. Notes: The special formula makes this product easy and quick to use, it provides brilliance, brightens the colours and takes care of footwear thanks to the waxes it contains. This product is also available in neutral, brown and dark brown. Remove any dirt from the surface to treat. Press the sponge repeatedly the first time to facilitate distribution. Apply the product evenly and allow to dry. Pass a moist cloth on the surface after 5-6 applications. Smooth or polished or "closed-grain", glazed, brushed, printed, eco leather. A blend of solutions with a wax base (water and waxes for protecting the leather) and resin base (water and resins for the shine), the product coats the shoe leather with a film that self-polishes when it dries. 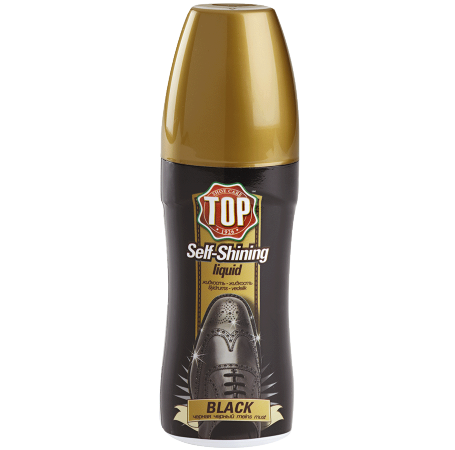 This product category does not nourish but is deposited on the surface and, for this reason, it is necessary to treat the shoes with a moist cloth every 5/6 applications of liquid self-polisher.